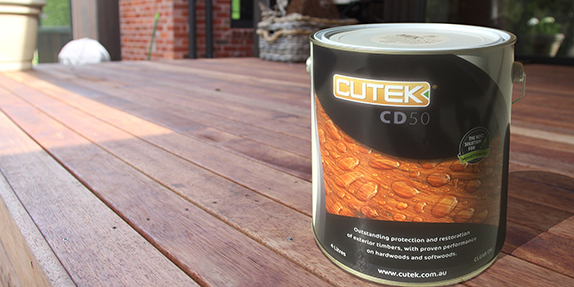 Something to consider when next purchasing either Hardwood decking or cladding is that we can supply it pre-oiled with Cutek CD50. Having us pre-oil your timber will not only save you considerable time and labour, but pre-oiling will give you a more even result than what you could achieve on site with a paint brush or roller. We always recommend oiling Hardwood cladding or decking to protect the timber from the elements. It maximises the timbers ability to remain stable and maintain durability. Getting it pre-oiled will ensure it is properly coated front, back and also in and on the tongue and groove. These are areas that can be missed when doing it on site where space to work can be an issue. Oiling after installation is not recommended because you are only covering what is visible. Timber expands and contracts exposing parts of the tongue that were not coated letting moisture in and possibly behind your cladding. Moisture from beneath your decking will be absorbed into the underside of your decking boards and be repelled only from the top increasing the potential of cupping. So, why should you get your cladding or decking pre-oiled? Ask about pre-oiling when next purchasing decking or cladding. It generally takes 5-7 working days on top of timber lead times.